Dr. Sarah Murphy, ND: So, as a naturopathic doctor, when a patient comes to see me, what I’m looking to do is treat the whole person…so looking at their mental health, their physical health, and their spiritual health. I’m also looking to find out what the root cause of their health condition is, and there may be many, but we’re looking to actually solve the problem so that they don’t have that health condition any more. One of the ways we treat our patients is using natural medicine to stimulate the body to heal itself so we will suggest diet and lifestyle changes along with using nutritional supplements, botanical medicine, homeopathy, and things like that to help the body to be stronger and more balanced. Dr. Emily Dashiell, ND: When a patient comes to see me, one of the first things I work with them on is their diet. When we talk about diet, I’m talking about the types of foods that the person is putting in their body. Most people eat more processed foods than their body is meant to handle. By processed foods, I mean foods with additives and dyes and preservatives. So with most patients, we start with putting them on a therapeutic nutrition plan focused around whole foods nutrition. When someone switches their diet from a processed food diet to a diet based in whole foods, they start to feel more energy, their skin starts to glow. They feel a more optimistic outlook on life, any many of their health problems start to resolve on their own. Dr. Lilian Au, ND: So, naturopathic doctors use many different types of natural therapies to help patients heal themselves naturally and safely. So, one of the things we do with patients is we try to, you know, have patients do some lab work to make sure that their vitamins and minerals are in, you know, healthy levels. But sometimes it’s not the case. Most patients that we work with are either vitamin or mineral deficient. So, we do recommend a different variety of supplements and minerals to help recover those mineral deficiencies or vitamin deficiencies either with supplementation, or through diet and lifestyle changes. One of the other natural therapies that we use is botanical herbal therapies. And, so we can use them safe and effectively to help with acute and chronic conditions. One of the main things that we do work with is immune support. So, one of the most popular herbs that we work with is Echinacea, which helps with the common cold, flues, even coughs. So, another natural therapy we use is homeopathic remedies, which work on an energetic level for many acute and chronic conditions. When the right remedy is used, it can have instantaneous results, and many of my patients have really benefited from, you know, getting the right remedy and the right dose for the common cold or cough, and it really helps to bringing that balance back and to healing naturally and safely. Dr. Angela Agrios, ND: If you’re wondering who should see a naturopathic doctor, anyone would benefit from seeing a naturopathic doctor. Naturopathic medicine is a system of medicine that helps people stay well, but it’s also very effective at helping people reverse chronic disease, and the reason is because naturopathic doctors will do their best to work with you to identify the root cause of your problem, not just address the symptoms. 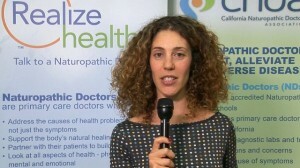 If you would like more information about naturopathic doctors, or about naturopathic medicine, please visit www.realizehealth.org. On this website, you’ll find information about naturopathic doctor-training and education. You’ll find information on various conditions that naturopathic doctors can help you with. You’ll also find patient success stories, and you’ll find a directory if you’re looking for a naturopathic doctor near you, you can enter a zip code and find a naturopathic doctor. Larry Cook, Natural Health Author & Video Producer: So, even though I’m into natural living and I eat very well relatively speaking and I take supplements, and I do all kinds of other things to try to keep my health up. I have had some health issues and I saw a naturopathic doctor and she did amazing work with me. Those health issues have largely cleared up, and I can’t say enough about naturopathic medicine. It is amazing! So, if you have any kind of health issue, or you’re looking just to get a tune up, I highly recommend visiting a naturopathic doctor you can go to www.realizehealth.org, and find a naturopathic doctor near you. And, like I said, I can’t recommend it enough. So, check out their website. Learn more about naturopathic medicine, and see what it can do for you. If you like this video, please hit the ‘like’ button, and if you’d like to see more videos on natural health topics, please subscribe to my YouTube channel, and if you have any comments or questions, please leave them. I’m Larry Cook. Thank you for watching.